DURHAM, N.H. - A giant black hole ripped apart a nearby star and then continued to feed off its remains for close to a decade, according to research led by the University of New Hampshire. This black hole meal is more than 10 times longer than any other previous episode of a star's death. Using data from a trio of orbiting X-ray telescopes, NASA's Chandra X-ray Observatory and Swift Satellite as well as ESA's XMM-Newton, researchers found evidence of a massive "tidal disruption event" (TDE). Tidal forces, due to the intense gravity from the black hole, can destroy an object - such as a star - that wanders too close. During a TDE, some of the stellar debris is flung outward at high speeds, while the rest falls toward the black hole. As it travels inward, and is ingested by the black hole, the material heats up to millions of degrees and generates a distinct X-ray flare. Lin received support for this work from NASA (Chandra Award Number GO5-16087X). The Chandra X-ray Observatory is operated by the Smithsonian Astrophysical Observatory for and on behalf of NASA. Caption: Artist illustration depicting the record breaking "tidal disruption event" (TDE). 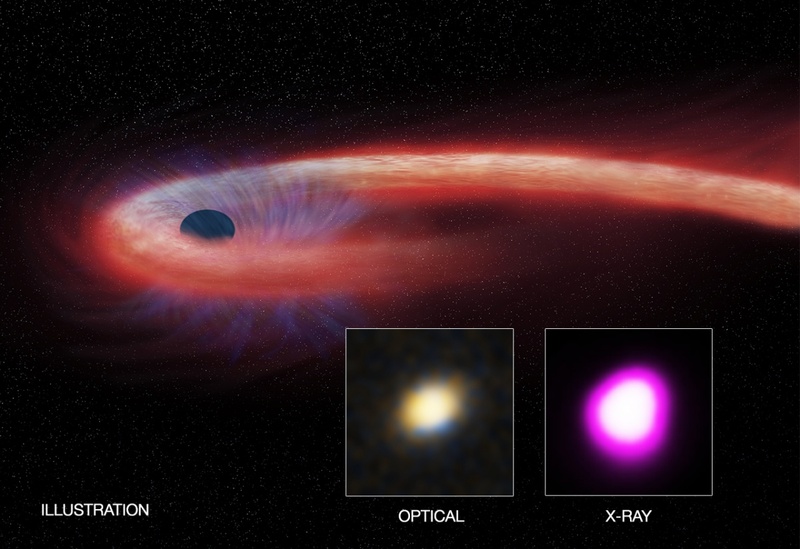 The red shows hotter material that falls toward the black hole and generates a distinct X-ray flare. The blue shows a wind blowing from the infalling material.